Dimensions 1.25 by 4.25 by 6.75 in. The world is going to end next Saturday, just before dinner, but it turns out there are a few problems--the Antichrist has been misplaced, the Four Horseman of the Apocalypse ride motorcycles, and the representatives from heaven and hell decide that they like the human race, in a new edition of the classic novel, featuring a new afterword from the authors. Reprint. So the armies of Good and Evil are amassing, Atlantis is rising, frogs are falling, tempers are flaring. Everything appears to be going according to Divine Plan. Except a somewhat fussy angel and a fast-living demonâboth of whom have lived amongst Earth's mortals since The Beginning and have grown rather fond of the lifestyleâare not actually looking forward to the coming Rapture. About: The world is going to end next Saturday, but there are a few problems--the Antichrist has been misplaced, the Four Horseman of the Apocalypse ride motorcycles, and the representatives from heaven and hell decide that they like the human race. About: The world is going to end next Saturday, just before dinner, but it turns out there are a few problems--the Antichrist has been misplaced, the Four Horseman of the Apocalypse ride motorcycles, and the representatives from heaven and hell decide that they like the human race, in a new edition of the classic novel, featuring a new afterword from the authors. 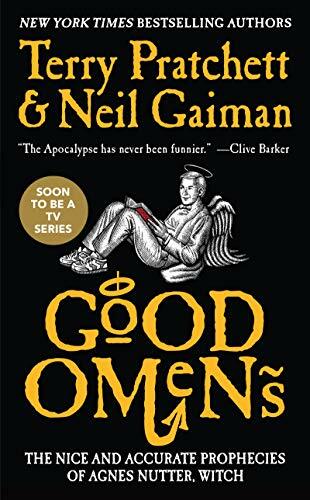 About: The world is going to end next Saturday, just before dinner, but it turns out there are a few problems--the Antichrist has been misplaced, the Four Horseman of the Apocalypse ride motorcycles, and the representatives from heaven and hell decide that they like the human race.